Chelsea Berkompas recently released an ebook, The Wool Project, which has so intrigued me. Besides having several of her beautiful patterns in it, one of which I'm almost finished knitting, it's just a charming read. She goes beyond clear pattern writing and beautiful photography to recommending complimentary yarns from various breeds of sheep. The sketches that accompany her info on each breed are such a nice, personal touch. 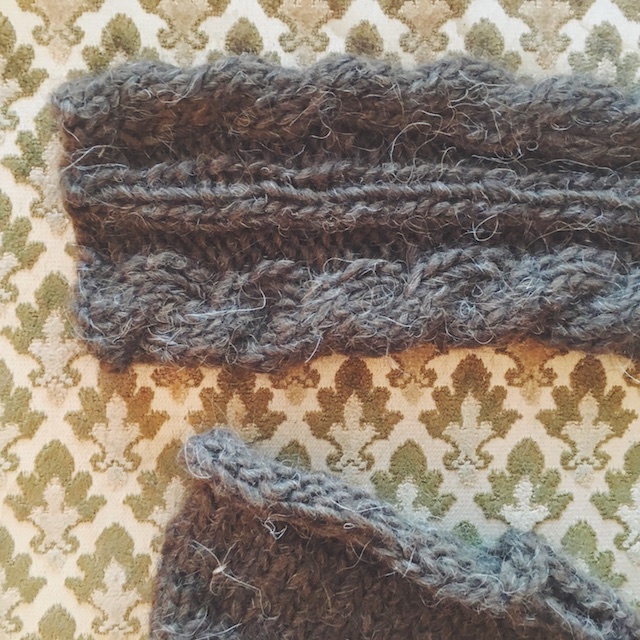 So, knowing I'm doing several knitalongs right now, I opted to join in on her Instagram Wool Project KAL by knitting a pair of Inniskór slippers... and then I knit another pair. They're quick and always useful during winter, when you have a home on piers. 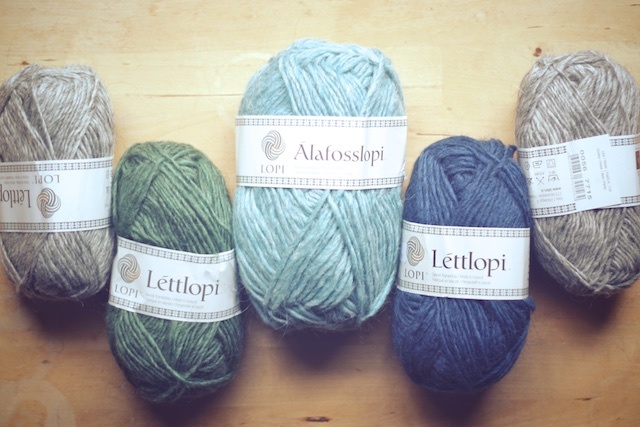 They also recommended a bulky Lopi that I have been wanting to use for a sweater (some of the colors I've collected for the Icelandic sweater, below). So, I cast on with some Ístex Álafoss Lopi in brown and had mine knit in about two days. While waiting for toggles to finish them, I even cast on another, cuff-less pair for my husband. Maybe you can't tell here, but these are like yeti slippers. I had to order another ball to finish them. 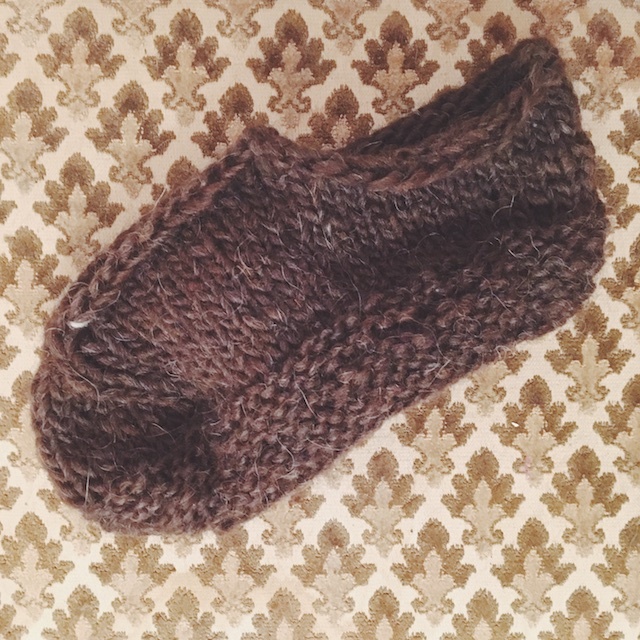 So with all the pieces knit and blocked, I could see the beauty of using this yarn for a durable slipper. It is incredibly resilient. After blocking, it bloomed slightly and made a more durable fabric than before, even. 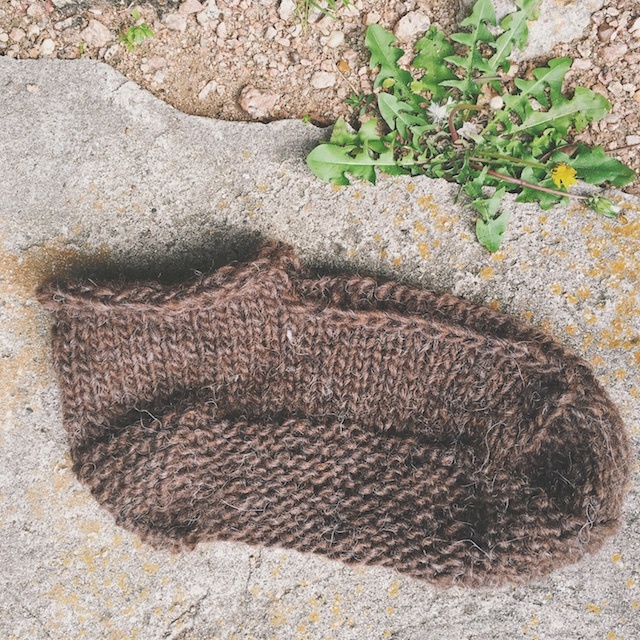 One knitter, maybe it was on instagram, said that she had a coat knit in Lopi many years ago and it had yet to develop pills. This stuff is seriously hearty. I want to say thank you, Chelsea, for encouraging me to try a new type of wool. I've spent most of my "knitting life" using whatever decent yarn I could get cheaply. This tended to be 100% wool or cottons from bargain websites. And there's nothing wrong with that, but there wasn't a lot of experimentation or insight into the materials I was using. Now that things in my life have settled down a bit, I'd like to consider my yarn a bit more carefully when buying. Chelsea also recommended Puffin by Quince and Co for these slippers. I've admired everything I've ever seen knit in their yarn, yet I've never seriously shopped their website. Last week, when perusing their yarns and beautiful color options, I realized this is really an affordable yarn for the quality. They have got soft, subtle color down. Their wool is 100% American, which makes me feel good, too. I kept imagining color combinations in their Lark base that would looks so nice for Andrea Mowry's Range Shawl. I have followed this project up by trying another yarn that's new, or newish, to me- 100% alpaca (for the Maximus hat) and I enjoyed savoring the new experience and what the fiber lends to the finished project. So, why do I have no FO photos of these slippers yet? Because I ordered some special horn toggles for them, but didn't pay attention to where they were shipping from. I probably won't receive them for a couple of months. So, I guess I'll be making a pilgrimage to Joann next week.